Welcome to wonderful world of Vedic Math..
2. Numbers near different bases like multiplier is near to different base and multiplicand is near to different base. So it is comparatively simpler. Here, we can use the sub sutra “whatever the extent of its deficiency, lessen it still further to that extent; and also set up the square of that deficiency”. In this, first corollary is “All from 9 and the last from 10”. This method will work for any type of squaring. There is another method by taking the sutra "Vertically and Crosswise" but that we will discuss later. 1. We shall take the nearest power of 10 (10 itself in this case) as our base. 2. 8 is '2' lesser than 10, so we shall decrease 2 from 8 (i.e. 8 - 2 = 6). This will become the left side of answer. Here working base is 10. Note: Number of digits in right side part of the answer should always be equal to the zeros in the base value. Extra should be carried forward to left side answer. If number of digits in right side answer are less than the zeros, then it should be prefixed by zeros. Another example to understand it more: 7862 . Here working base is 800. So this is all about squaring the numbers by using the base values. Isn't that quite simple and interesting approach.. 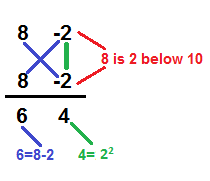 In next article, we shall discuss about Vertical and Crosswise multiplication.